The Justice Center News blog features our advocacy on issues affecting low-income New Yorkers today and the latest CBJC happenings. For press releases, click here. For publications, click here. Facing the dangerously cold temperatures across the nation can be an added challenge for the residents of New York City’s severely aged rental housing. As a tenant, you are entitled to a safe residence, hot water, and adequate levels of heat. Being deprived of these minimum standards can quickly put you and your family’s health in jeopardy. Between 6 am and 10 pm, the heat inside your apartment must be at least 68 degrees Fahrenheit if the temperature outside is below 55 degrees Fahrenheit. Between 10 pm and 6 am, the heat inside your apartment must be at least 62 degrees regardless of the temperature outside. Hot water must be available at a minimum of 120 degrees Fahrenheit, or a minimum of 110 degrees Fahrenheit if an anti-scald device has been installed on the hot water system. Winter weather can also expose other problems with your home. Leaks, cracked or inoperable windows, and plumbing problems are all common with the extreme cold and can make dealing with the cold temperatures even worse. It is your landlord’s responsibility to properly maintain your apartment and provide you with heat and hot water. Tenants are often reluctant to ask for repairs because they don’t want to be a bother, or are worried about being blamed for causing the condition. 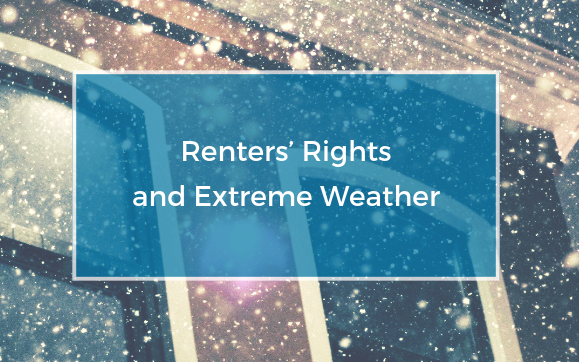 But it is important to remember that you have rights as a tenant, and your landlord has an obligation to make sure things are running properly- even if you happen to be behind in rent. Buy an indoor thermometer. This will help you determine if the heat in building is keeping your apartment at the legally required temperature. Keep a log of your temperature readings. Noting the time, date and temperature of your apartment won’t just help you if you need to make a formal complaint- it also may convince your landlord to make adjustments to the heat. Speak with your landlord if you are having any problems. Sending a letter to your landlord certified mail with a return receipt is one of the best ways to show you gave your landlord proper notice of the problems you were having. You can get free assistance collecting information and writing a letter to your landlord on the internet at justfix.nyc. Call 311 or register a heat complaint with New York City online at nyc.gov. The City will record your complaint and inform your landlord, and may send out an inspector to place a violation. You should continue to call at least once a day while you have inadequate heat or hot water until the situation is resolved. Consider starting a lawsuit against your landlord in housing court, known as a Housing Part (HP) action. In an HP action, judges will frequently issue orders to correct the violations in an apartment, and can issue fines or other penalties against landlords who don’t fix the conditions, or can order the City to make emergency repairs. In addition, inadequate heat and hot water usually affect the entire building. There might be other people in your building interested in joining your efforts to get repairs, and there is often strength in numbers when it comes to making complaints. Please also remember to check on your elderly and vulnerable neighbors!